BRINGING SOME ORDER INTO CHAOS The south of Warsaw is a chaotical neighbourhood with different architecture styles, varying building heights and a big amount of green areas that spread between them without any clearly defined shape and order. At some point it stopped beeing a dormitory and more people started to settle there for good. A neccesity for a new city center with office spaces and retail areas appeared. The proposed form of the design would organize all these factors. Most of the space of the exhisting site is taken by a shopping mall and it’s adjacent big parking areas. These retail functions mostly have not appealing facades ( wich serve as big ads to sell the products) and big flat unused roof areas.In this case they would serve as a base for the whole complex and their potential would be used to the maximum. 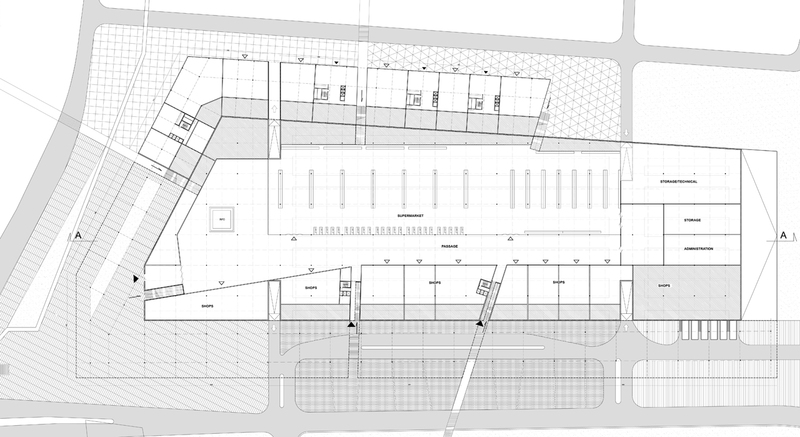 By extending the forrest that lies next to the site ,on top of this retail block and creating paths connecting the main surrounding streets a new public park would be created. The office spaces would be spread around this green development in blocks with different heights wich would depend on the next surrounding neighbour. This would create a connection with the old housings and make the whole district more consitent and compact.